For those without coords and/or more visually oriented, Tremor can be found here. 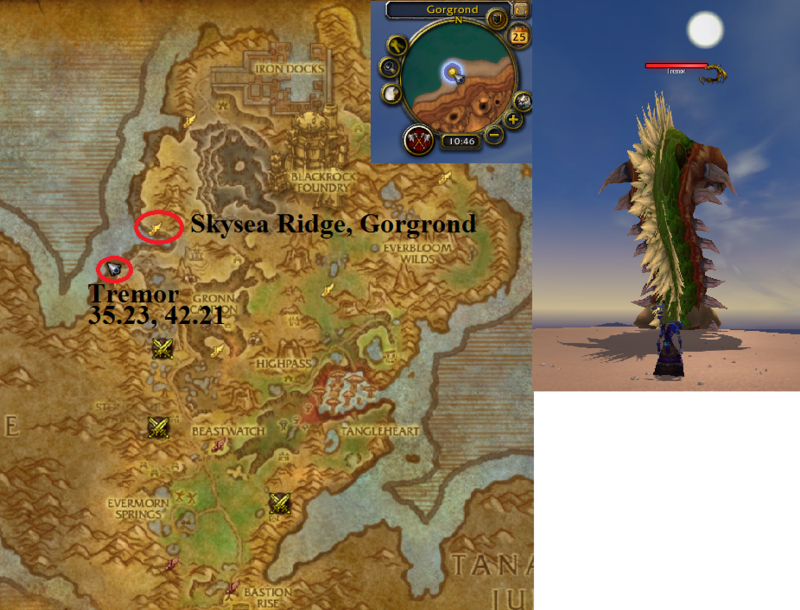 Tremor is located in Gorgrond (coords 35.23, 42.21). Fly to the Sky Sea Ridge flight point in the NW of Gorgrond. Make your way around the edge of the canyon and head into the field of petrified Gronns (Gorgrek's Fall). When you see a quest mob named Duurg, head right. There is a path down to the water (coords 37.90, 41.97). Then simply head towards the blue marked area on your minimap. You or your group will have to tap it first. There is no credit for assisting others (ie cross faction). Avoid the AoE and use the net you get off the lobstroks to stop Tremor from submerging. The net has a 2 minute timer but can be used repeatedly as long as you have it. Be sure to re-cast the net right before it runs out.